Love buffalo wings? How about blue cheese? 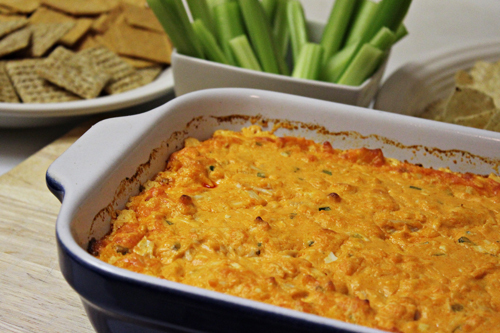 Buffalo Chicken Dip is a mix of both creating a delicious dip for tailgating and parties. I’ve never been tailgating, so when I learned that this week’s #SundaySupper theme would be tailgating food, I had no clue what to make. I *think* some of the food I cook would be perfect for tailgating, but I started overthinking it, as usual. I turned to my friends and they helped give me insight into the world of tailgating. They even gave me links to tailgating food on Food Networks site, and more. I quickly realized it wasn’t complicated and it was then that my friend, Amanda, suggested that I made Buffalo Chicken Dip. I’ve seen recipes around for this, and thought it looked like something we’d really like, but I hadn’t made it yet. I couldn’t think of a better time to try it out, so for this week’s #SundaySupper (hosted by Lane of Supper for a Steal) I decided to go for it and try the ever-so-popular Buffalo Chicken Dip! I’m so glad I made it, because it’s awesome and exactly how I hoped it would taste — just like a spicy buffalo wing dipped into blue cheese dressing. I based my recipe on the one by FRANK’S REDHOT (one of our favorite products), tweaking it here and there to give it my special touch. 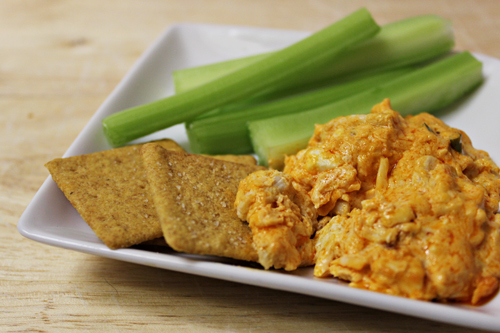 We served our Buffalo Chicken Dip with tortilla chips, crackers, and celery sticks — which is my favorite way of enjoy this. If you like buffalo wings and blue cheese, I think you’ll like this. Place chicken breasts in a pot large enough to hold them. Cover chicken with water. Heat on high to boiling and then reduce to medium. Cover with lid. Continue to cook for approximately 20 minutes or until fully cooked through (165 degrees F when checked with meat thermometer). Chop into small pieces or shred. Preheat oven to 350 degrees F. Spray a baking dish (approx 2 1/2 quarts, 12″ x 8.5″, or 13×9″) with non-stick cooking spray. In a large bowl, place cream cheese. Beat on low with an electric mixer just until cream cheese is creamy. Beat blue cheese dressing into cream cheese on low, just until incorporated. Beat FRANK’S® REDHOT® into cream cheese/dressing mixture on low, just until incorporated. Stir in blue cheese, colby-jack cheese, green onions, and chicken by hand. Spoon dip mixture into prepared baking dish. Bake in oven until hot, bubbly, and heated through (approximately 20-30 minutes). Serve with crackers, tortilla chips, or celery sticks. –If you wish, you can substitute 4 cans (12.5 oz. each) of chunk chicken breast in water, drained. –Light cream cheese may be used, if you prefer, as well as light dressing and reduced fat cheeses. –Tailgating Tip from Frank’s REDHOT website: Prepare dip ahead and place in heavy disposable foil pan. Place pan on grill and heat dip until hot and bubbly. If you want more delicious tailgating recipes, you’re in luck! 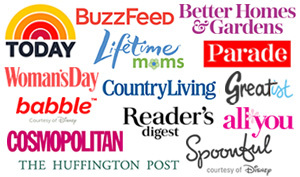 Below are the links to lots of other bloggers who are also participating in this week’s #SundaySupper and who are also sharing tailgating foods. And don’t forget to join us on today (Sunday) as we share our favorite tailgate recipes and tips. Hop on twitter at 7pm EST for the live #SundaySupper chat. sounds spicy and great! Must try soon! YUMMY! 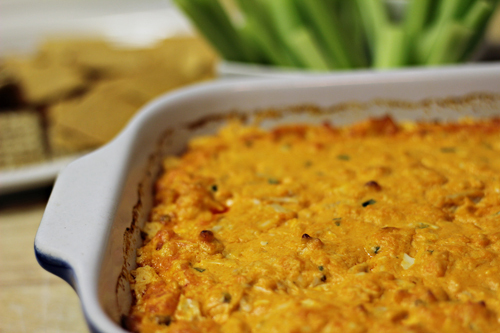 Buffalo chicken dip is a staple in households everywhere (or at least in PA). I’m glad you made it because tailgating wouldn’t be complete without it! Oh my I just love this dip and can totally imagine myself enjoying some crackers and veggies with it :)lovely mix of flavors and textures! Your buffalo dip looks fantastic. Can’t go wrong with cheese and hot sauce in my book! Looking forward to meeting you at Mixed! Ooh a dip that actually had chicken in it ! How creative ! I would just eat that plain like a meal. Thanks for sharing such a neat recipes ! This sounds so amazing! I have found more recipes I want to try this week for #SundaySupper than ever before! I bet the girls would like this if I toned down the spice a bit. Will have to try. Gotta have a cheesy dip when watching the game! Great choice! I had a taste of buffalo chicken dip at a Super Bowl party a few years ago and had to physically move myself away from the table. I couldn’t stop eating it. I like this version with the fresh chicken. What a great dip! My co-worker made this for an office party 1 time. Needless to say we requested it every party after that! I’m really going to try this recipe at home. I know it’s made in the oven but she used to bring it in a crockpot and keep it on low so we could snack on it the entire day. So yummy!!! What a wonderful recipe. I have yet to make this, but will soon. Wow. Looks great. I’ll have to try this one when I throw a Super Bowl party. Brandie, this dip sounds like its PACKED with fabulous flavour! The perfect thing to scoop your munchies into in front of the TV (my idea of a heavenly time!). oh gosh this sounds like a fantastic dip! yum! My husband loves this dip! I think he would like it at every get together he went to! This is by far, one of my most favorite dips to indulge in any time…tailgate, party, BBQ, whatever! So yummy! Now I need to make it next week! YUM! 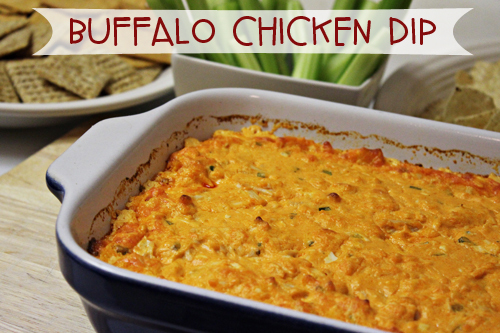 Buffalo chicken dip happens to be my very favorite dip. Do you deliver 😉 Happy #SS! I’m always looking for new dip recipes–I can’t wait to try this one! I make that Frank’s version yearly – we love it! This looks so good..I want to dive in face first (ouch)!! Yum, that looks crazy good!! I love buffalo chicken! Never thought of doing it as a dip. What a great idea!! I made a similar version of this dip for Secret Recipe Club last month, and we loved it too! It’s basically the perfect football-watching food…addictive! This looks yummy now all I need to find is some gluten free blue cheese dressing. I love Franks RedHot Sauce! What a great dip for a #SundaySupper Tailgate! See you tonight on twitter @fromagechick! One word- AMAZING. I cannot wait to try this!!! Thank you for giving me an awesome recipe idea for our next football tailgate!!! Thank you thank you thank you!! YUM!!! This looks like one of those dips you can have just one bite!!!! Can’t wait to try! We LOOOOVE this dip! It’s one of your faves! YUM! Sounds like a great dip to nosh on while watching the football game! Yum! You have selected the right recipe, Brandie! It’s look so delicious! Buffalo anything is a great choice for tailgating, Brandie! If you are looking for me at the party I will be hovering over this dip. Sounds so delish!! I made dip too – you just can’t have anything better for a game! 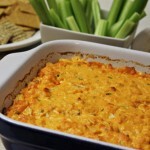 I love a good buffalo chicken dip! Yum! Love how easy the recipe is and thanks for the great list of other tailgate foods!